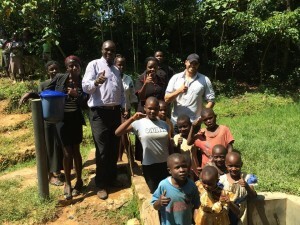 This is the second project as a part of the Global Clean Water Initiative, the link to the completed first project can be found below. Prior to the completion of the first project I traveled to Kenya to visit the communities that would ultimately benefit from the project. While it is difficult to understand the impact of these projects without personally seeing it, the reality is that these projects change lives. My travels through rural Kenya and other regions of the world suffering from extreme poverty have given me insight into human condition. It is impossible to solve all of the world's injustices, but complacency to these injustices is analogous to condoning them. aiming for 75% by the year 2015, have fallen short by nearly half a billion people. 02/03/18 Jose Long $50.00 Thanks again to everyone helping with the project, it is very much appreciated! 01/31/18 Lauren Whitney $15.74 Hope it helps! God bless! 01/29/18 Sara Gonzales $34.00 Thank you. 12/05/17 Fernando Ceballos $50.00 Keep doing what you are all doing! 11/14/17 Miranda Reinhard $50.00 This is a wonderful cause, may God bless this endeavor! 11/12/17 Amber Zuniga $35.29 Way to save the world!! 10/27/17 Lisa Waddell $35.29 This is awesome! Thank you! 10/13/17 Geneva Walker $15.00 Hope this helps Jose! Best of luck. 10/06/17 Cindy Teniente $20.88 God will bless this project! 09/20/17 Pablo Soberanes $15.74 Best wishes! 08/07/17 Carmen Marrufo $50.00 I am proud to have a nephew with a generous heart. 07/15/17 Elsa Long $140.25 You inspire me my son. Happy to contribute to this project. 06/25/17 Anonymous $10.00 Best of luck with this amazing initiative. 06/18/17 Eduardo Assef $70.28 God Bless! 06/17/17 Kristina Loftin $140.25 Thank you for organizing this! I'll get my company to match! 06/15/17 Adrian Aparicio $35.29 Keep on, keepin' on! 06/05/17 Sarah Bensley $26.03 Good luck spreading love and bringing fresh water to those that need it!! 05/29/17 Maria Guardiola $34.00 Way to go, Jose! 05/15/17 Michelle Lovingshimer $20.88 Keep doing good works! 03/12/17 Bradley Gaulden $26.03 Here ya go Jose! Good luck! 12/17/16 Victoria Jimenez $15.00 Wish I could donate more, keep up the good work! 10/22/16 Matthew McMahon $70.28 Keep up the good work Jose! 10/10/16 Anonymous $35.29 Thanks for doing this, Jay! 10/05/16 Clarissa Delgado $25.00 Thank you for your work! 10/03/16 Sarah Edwards $140.25 Keep up the great work! 09/22/16 Michael Catarineau $35.29 Keep doing what y'all are doing! 09/20/16 Taylor Hansen $35.29 Thank you for letting me know about this! 09/09/16 Jade Menio $70.28 Pretty awesome! 09/08/16 Anonymous $500.00 Glad I could be apart of the effort. Praise The Lord! 09/05/16 Kaitlin Burroughs $51.75 Praying for the lives that will change because of this project. 07/24/16 Samantha Bates $100.00 A smile on a Childs face is priceless. 05/27/16 Florida Nyanpinga $50.00 Go with Grace! Thank you for thinking of others. 05/25/16 Jairrah Mansfield $211.25 I pray that this project extends to many people and dramatically impacts their quality of life. 05/07/16 Brian Bishop $34.00 Gig'Em, best of Luck!